I've admitted to this before, but growing up in northeast Ohio, I was a pretty terrible Ohioan. I basically ignored most of the cool things in my own state (and even in my own country), instead always focusing on getting out. I went to *maybe* once a year. I didn't visit Put-In-Bay for the first time until well after I graduated college. I've never even been to Amish Country. And, up until I moved to Twinsburg, I had barely set foot in Cuyahoga Valley National Park. Shame, shame on me on many counts. Not only is my home state pretty freaking awesome, but it's one and only national park is also worth way more attention than I gave it in my teens and twenties. But I'm amending that oversight now, attempting to visit as much as I can in every season. Cuyahoga Valley National Park is the only national park in the state of Ohio. It stretches from Cleveland to Akron, following the Cuyahoga River through some beautiful sections of deciduous forest. It was first established in 1974 as the Cuyahoga Valley National Recreation Area and then was designated as a national park in the year 2000. 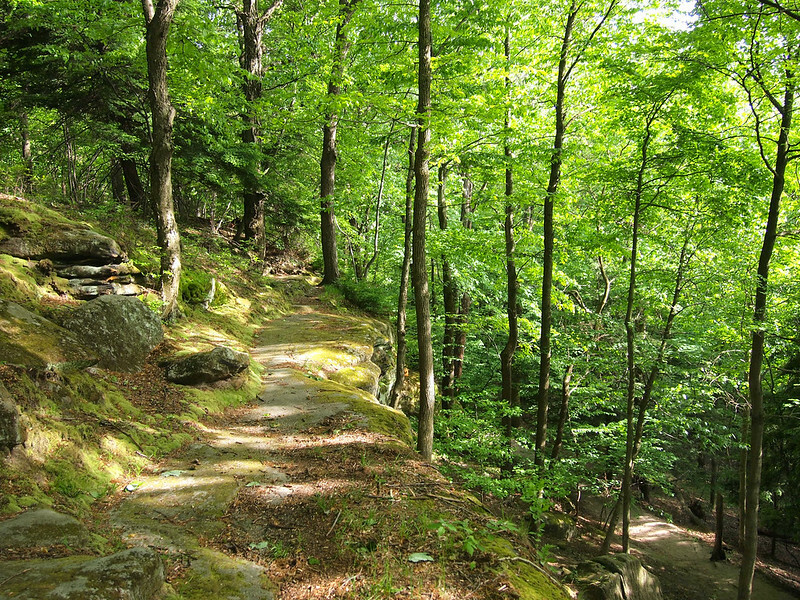 These days, people head to the park for outdoor activities like hiking and biking, taking advantage of the miles and miles of trails that take you through scenery that varies from marshy wetlands to mossy limestone ledges. There are even a few waterfalls! Living so close to Cuyahoga Valley National Park these days, I've become quite proud and protective of it. My husband and I are members of the , and we take our bikes (or our hiking shoes) to the park as often as we can. And now I'm on a mission to make other people fall in love with the park, too. 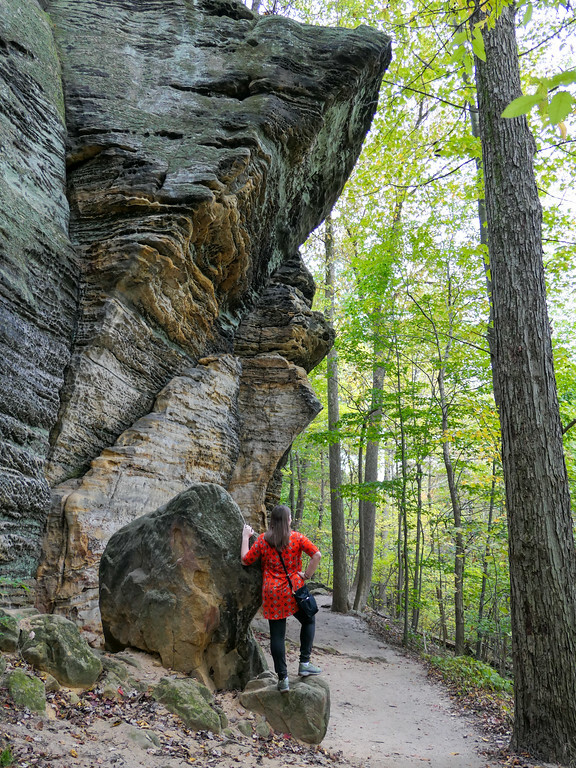 There are miles upon miles of hiking trails within Cuyahoga Valley National Park (over 125 miles of them, according to the National Park Service), but my favorite trail by far is the trail that takes you around the Virginia Kendall Ledges. This 2.2-mile trail is a moderate one, taking you through a forested landscape dotted with gigantic limestone boulders, caves, and mossy cliffs. This is one of my favorite places in the park to take photos! 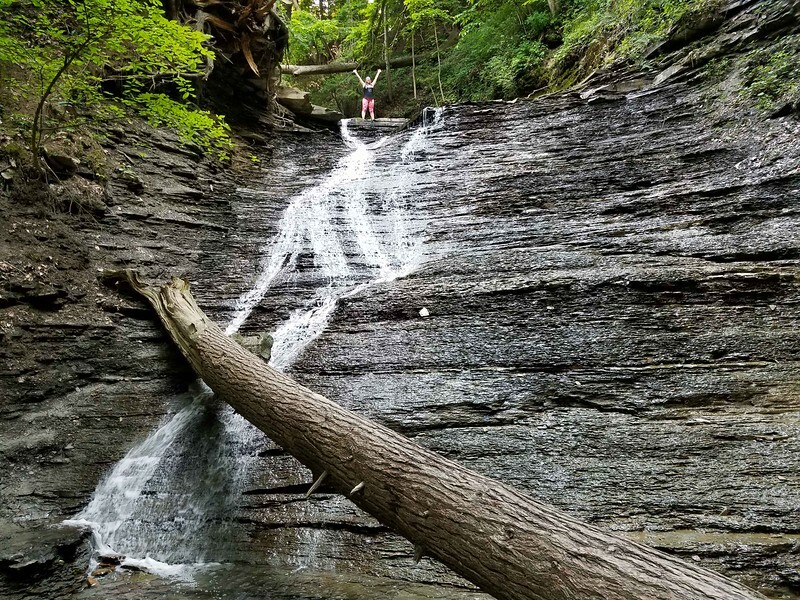 If you're interested in some of the other waterfalls in Cuyahoga Valley National Park that you have to hike to, I also recommend Blue Hen and Buttermilk falls. 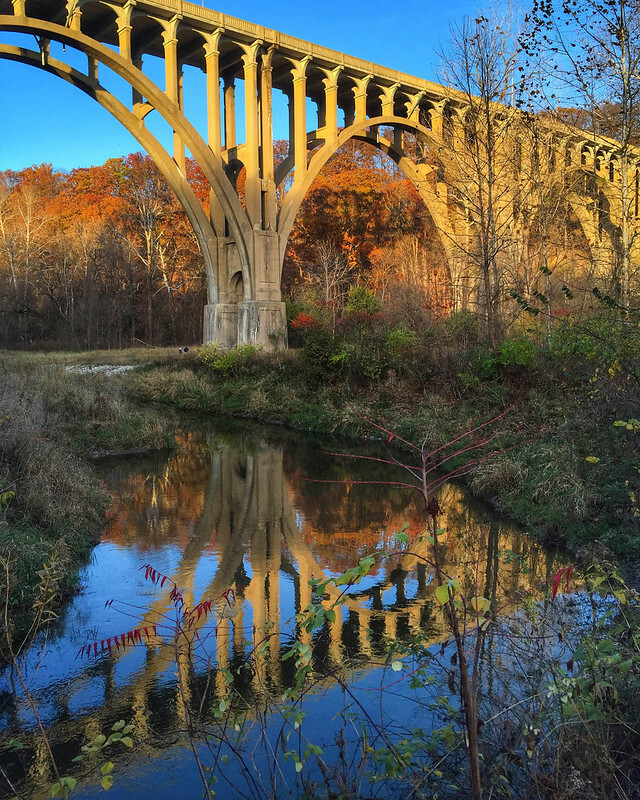 Since CVNP runs along the Cuyahoga River, this means that the river's history is also now part of the park's history. Back before the days of airplanes and reliable railroads, goods were transported throughout northeast Ohio using a canal system. Today, the path that mules used to use to tow boats up the historic Ohio & Erie Canal in the 1800s has been turned into a multi-purpose hiking and biking trail. 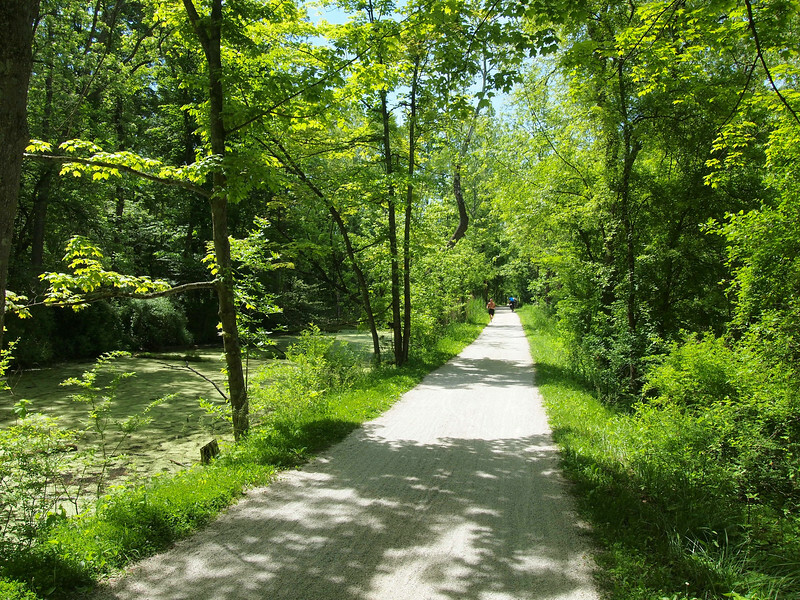 The Towpath Trail is one of my favorite places for a bike ride, since it's mostly paved, mostly flat, and so very scenic. Elliot and I like to start in Peninsula for many of our rides since there are some shops and a restaurant near the trailhead. If you live in northeast Ohio, chances are you've heard of Szalay's Sweet Corn Farm and Market. During the summer months, this farmer's market is a great spot to either visit on its own, or to ride to on the Towpath. I love the colorful fresh produce and the grilled corn you can pick up for a snack. In the fall, they also put on a great corn maze! Cuyahoga Valley National Park is unique in that is also has a railroad running through it. The is extremely popular with park visitors, especially during the autumn when the park bursts into fall colors. The railroad operates scenic rides, themed trips (such as their popular Polar Express trip), and even has a where you can ride the train one way and bike the other for just $3. WHERE: Northeast Ohio, roughly following the Cuyahoga River between Cleveland and Akron. WHERE TO START: The official visitor center for CVNP is at the Boston Store Visitor Center on Boston Mills Road. WHEN: Cuyahoga Valley National Park is open year-round. Visit in all four seasons to see how different it looks! HOW MUCH: $0! 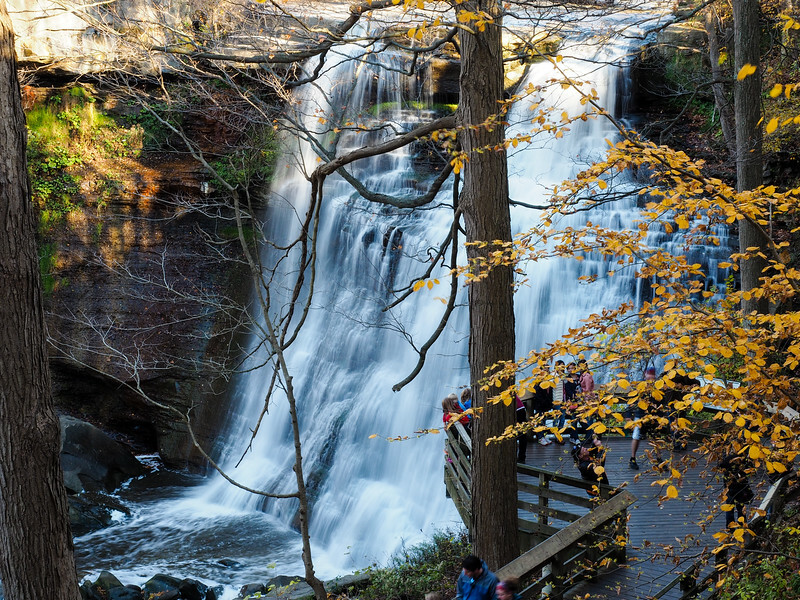 There is no entry fee to enjoy Cuyahoga Valley National Park. BIKES? 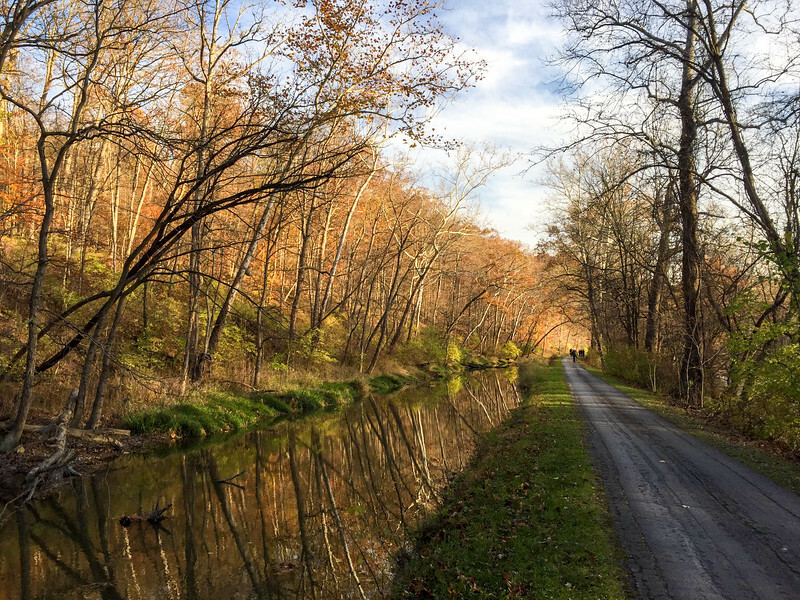 : If you want to hit the Towpath trail but don't have your own bike, check out Century Cycles near the Peninsula trailhead/train depot for rentals. TRAIN? 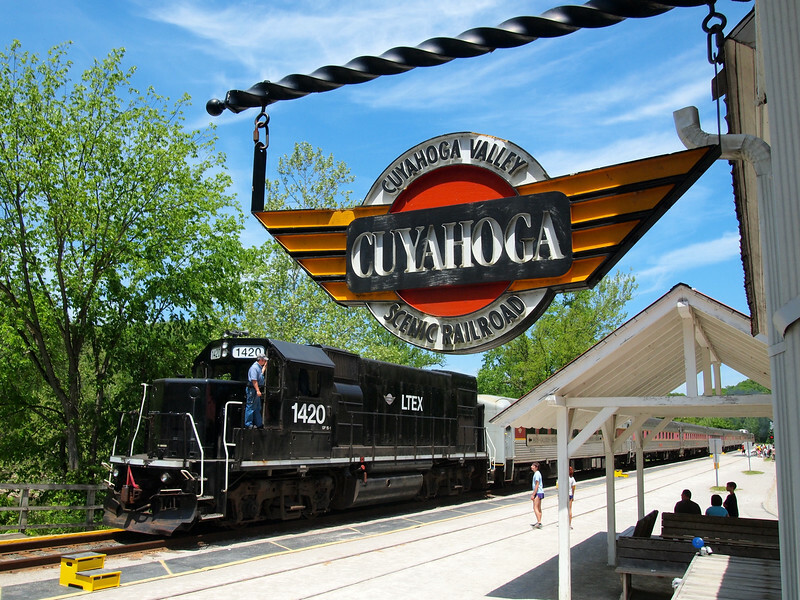 : The Cuyahoga Valley Scenic Railroad departs for scenic rides through the park anywhere from 2 to 4 times per day from June to October. The Peninsula Depot is the most popular place to board the train. WHERE TO STAY: The park is large and covers a handful of cities. There are some places to stay within the park, too, though, like the and the . 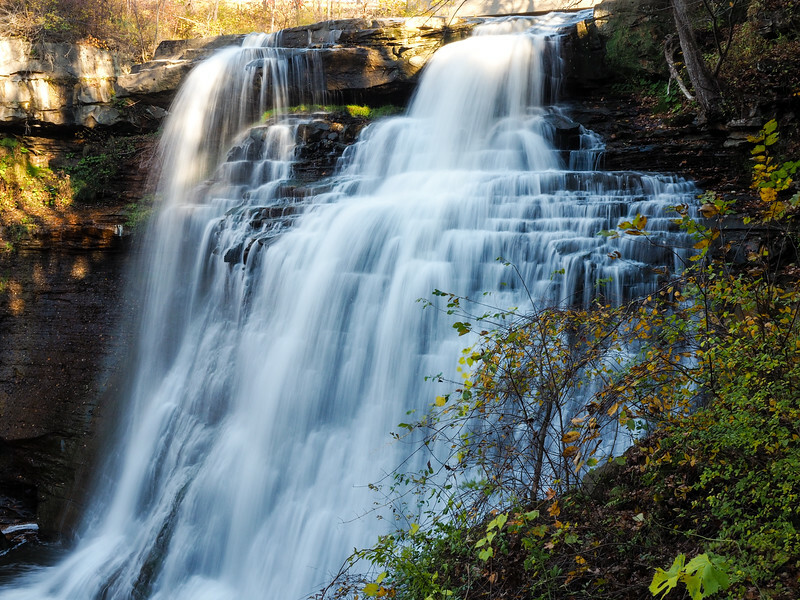 Have you ever been to Cuyahoga Valley National Park? If not, does this post make you want to visit? Thank you so much for posting this! I honestly had no thought or desire to visit Ohio…until last week when my sister and I were exploring our genealogy and found some ancestors that were born there. Now the history, land and historical sights seem like treasure boxes. Ohio often gets overlooked by tourists, but there really is so much to see here! This is encouraging me to look at my home are as a visitor would. We also have a very large Amish community near me. I’ve been through Ohio, actually spent a day in Cleveland. Thoroughly enjoyed the R&R Hall of Fame. Didn’t get a chance to go to the Christmas Story house?. Would like to go back and see more. Cleveland is quite a cool city once you spend some time there – I definitely need to write more about it on my blog! Never heard about this park… actually, we don’t really know what’s worth seeing in Ohio either. Glad to read this post! Yup, that’s so true! But I’m trying to be better about seeing more of my home state (it’s a great way to still “travel” in between trips!). Mmm grilled corn! Szalay’s is the best! Akatuki, I was so excited when I saw this post. I grew up right in middle of Cleveland and Akron, and while my parents always took us biking though the area, I never quite understood how lucky we were to have this beautiful park just a few minutes away. I recently went back to Ohio to see family and realized how beautiful that area is. After your post, I think I have my itinerary planned for the next time I go to visit. Definitely so lucky! And the fact that it’s free to visit is just icing on the cake! I think the Midwest has so much to offer and this is an absolutely amazing example! That’s awesome! The Midwest really IS great, and I’m enjoying exploring more of it every year! Ha I was the same in terms of exploring my own country. I’m making much more of an effort to explore the Netherlands nowadays. Cuyahoga Valley looks like a gorgeous park, especially the train is something I wouldn’t want to miss! The train is very cool – it’s a unique way to see the park! And good for you for making an effort to see more of your own country! Ah, such good memories. I used to visit Cuyahoga Valley once a year or so while growing up in Ohio. I’m glad you enjoyed it there, too! I love it here! It’s one thing I would definitely miss if I moved away from Ohio. The park looks beautiful and refreshing! I think most of us bad travelers when it comes to our own backyards. We set out to travel the far-flung places but ignore what we have at home. Like in my case, I visited Taj Mahal just last year and that too when Uttar Pradesh Tourism Board held a travel writers conclave and invited me! Yes, it’s so easy to ignore your own backyard, or to keep pushing it off until “later.” But I’ve discovered what a mistake that is! I feel like I’m always traveling now, even when I’m at home, because I’m making it a point to explore more of Ohio whenever I can! Hi Akatuki! I tried ing you via email but it is saying your email address is no longer valid. Please email me at [email protected]. Thanks! Ha, I can relate so much. I am the worst Californian! I have been to Italy, how many times? But I have never been to the Grand Canyon or Yosemite (well, I went when I was little, but I don’t remember, so I don’t count it). I have been getting out more in my area, but those are two big ones I still need to hit. This looks beautiful! I will admit until recently I didn’t know that Ohio had a national park! We just returned from a trip to the Mighty 5 last week and bought the glossy book to read through on the way home – I can’t wait to visit CVNP! Eventually I would love to visit all the national parks in the US – I’m sure there are quite a few I’ve never heard of, either! We went to a DMB concert at the nearby amphitheater a couple summers ago and also had to check out the National Park – it’s really beautiful, and lots of nice little hikes to check out! Ah, Blossom. Such a fun concert venue! Glad you liked the park, too! My husband and I visited Cuyahoga National Park last year on our way back to NJ from Oregon. I was very impressed with the amount of greenery which cooled down the park. We always stop at one Ranger Station in every park we stop in. I do the park passport program which allows you to stamp your book at every park and if you wish you can purchase the stickers for the parks. We are not hikers or bikers but we do drive thru any park we run across. I call Cuyahoga the GEM park. It is truly beautiful to drive through. It is a true GEM to visit. I’m so glad to hear that you enjoyed it so much, Kathleen! The Virginia Kendall Ledges are my favorite! And fall is a really great time to go. Great article, Akatuki! Cuyahoga has been on my list for few years now. And after reading your article and seeing your pictures, I know, I need to find time to visit it this year. Especially, that I’m so close (Detroit suburbs). Absolutely! It’s one of my favorite national parks because of how accessible it is, and because there’s so much you can do! I too was a terrible Ohioan when I lived there. I didn’t visit Cuyahoga National Park until after I had moved out of Ohio, started loving national parks, and realized I should visit the one in my home state. You did a great job of giving others insight on such an awesome place! Unfortunately, I only visited once in the freezing winter, but I’ll definitely use this post when I make it back there! I think we all tend to overlook the things that are in our own backyards! I highly recommend visiting again sometime in the summer or fall! 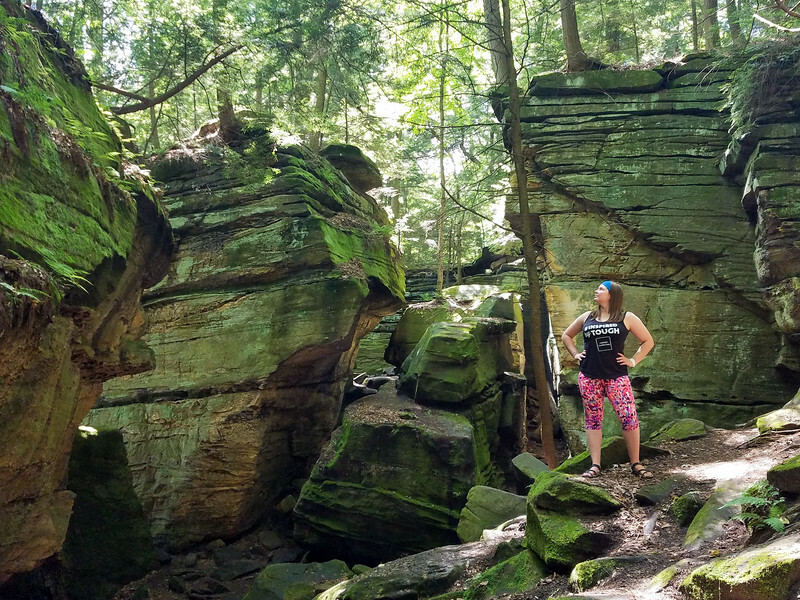 Cuyahoga Valley is underrated as a national park, so I’m glad it’s now on your list! Thanks! You should definitely visit! Thanks for promoting CVNP. I too have lived in NE Ohio for most of my life and didn’t come to appreciate the gem in our backyard until more recently. I first “discovered” the Towpath and found it is a great place to run. If you’re training for a race, they have water fountains at “just the right” places. Recently my running pals and I expanded our adventures to the trails. I had NO IDEA there were so many amazingly trails. The park is really a great place for all to enjoy. The Towpath is very accessible. For people who have to make a bit of a drive to get there, Peninsula is a wonderful place to meander about; stop in the shops, go for breakfast at Fisher’s on the weekends. Or the Winking Lizard for lunch or dinner. And don’t forget the dozen or so farms nearby. The Towpath is so great! As are all the other trails and sections of the park; I still haven’t seen it all!